But if weight loss is your goal, the numbers on the scale can be a valuable piece of information and way to monitor progress. 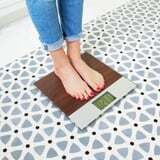 If you’ve recently made a change to your diet or your activity level, weighing yourself can be a good indication of whether what you’re doing is working. If you choose to use the scale as a tool, NASM- and NSCA-certified personal trainer and nutrition coach Chad Hargrove isn’t a fan of once-a-week weigh-ins but rather weekly averages. “You should get on the scale more, not less,” he said. If you weigh yourself every morning, you can calculate the seven-day average to more accurately illustrate true progress over time. What’s great about weighing yourself daily is that it gives you more of the big picture. As shown in the graphic, if you only weighed yourself on Fridays, you wouldn’t see that you are in fact losing weight faster than you thought. Still not convinced? A small study run by Cornell University found that men and women who weighed themselves daily and tracked the results not only lost weight, but after two years, the average weight regained was close to zero pounds. Be mindful that you will see fluctuations every day. It’s totally normal based on whether or not you’ve had a bowel movement, how much you ate or drank the day before, how much you exercised, whether or not you’re retaining water, etc. Knowing you’re taking the average of those seven days can put your mind at ease about those daily fluctuations. On a personal note, I’ve been using this method for a few months, and it’s been so helpful in monitoring my progress. Of course, we’re not saying that weighing yourself daily (or at all!) is absolutely necessary to reach your goal. But if you see progress, it can inspire you to keep going. Do what works for you!